The particularly interesting fact about this box is that it was used for what seems to be three different purposes. Not only can we see that there are (or were) three labels on the box, but also that there are three different stampings on the box. The first and earliest stamp being “21″ (first quarter of 1942), the second stamp “24″ (fourth quarter of 1942) and finally “53″ (third quarter of 1945). The labels also fit this strange array of production dates: the earliest label wraps around the box and is much lighter in color: common characteristics of earlier labels in the 1940s. So why does this box have so many stamps and labels? The reason has to do with the state of the Marklin factory during the Second World War. 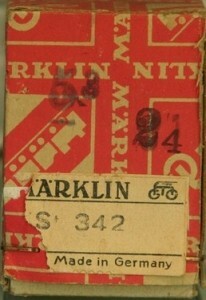 Perhaps first produced in 1942, this 342 was never shipped out to a dealer and it was therefore held in Marklin inventory. 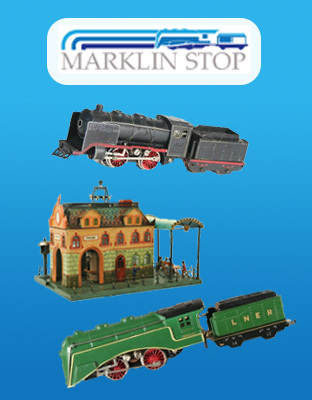 During the period from 1942 – 1945, Marklin sold very little and was seemingly dormant. 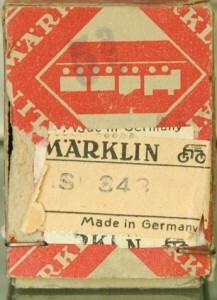 When 1945 came around, Marklin was allowed to sell again to American and allied soldiers. All the materials they had were old boxes from 1942, so they had to rip the labels off, re-label all the boxes, and stamp the boxes with the appropriate year and quarter. This is the same with many boxes from this period and it is common to see whole sets (341, 342, 343, and 344) with these characteristics. 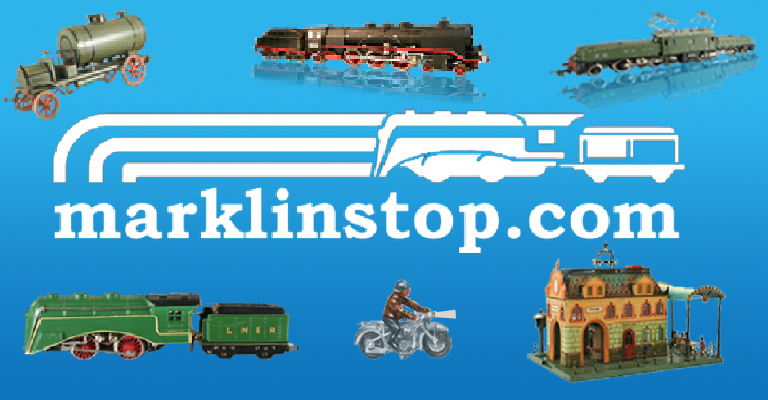 Really interesting and astonishing facts – Märklin reflects history… Thank you for sharing your knowledge with us, Paul!